Remember that this section deals specifically with Group Policies which lockdown the machine. 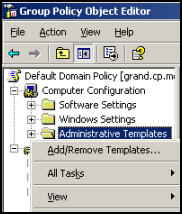 As with all Computer Configuration Policies, Administrative Templates affect all users who logon – including the administrator. Did you know that the newer Windows 200x Administrative policies remove the settings from the registry when the user or computer is outside the scope? ADM Administrative Template files started life in NT 4.0. The idea is that Group Policy settings, which control the registry, can be imported to the GPO and so give you command of the users environment. To begin with no action is required, Windows Server 2003 automatically loads 5 built-in templates. Later, you can add other ADM templates, including Group Policy templates that you make yourself. On no account rename these templates. If you do rename the above original Group Policy templates, then when you apply a service pack your policies will be deleted and replaced by default the above defaults. Be aware that there are two sets of Administrative Templates, one for Computers and another for Users. Should there be a conflict of settings, then the Computer Configuration wins. For example, if ‘Prevent Access to 16 bit applications’ is enabled in the Computer Configuration, but disabled in the User Configuration, then enabled wins because it’s in the Computer Settings. The logic being, by the time the user logs on, too late, the Computer Configuration has already run. Group Policy Management Console (GPMC) is installed. right-click your policy, then edit. Navigate to the Computer Configuration. Next, expand the Administrative Templates then Windows Components.